The most common type of heart ultrasound performed is the transthoracic, which is performed by placing the ultrasound probe on the outside of the chest wall near the sternum. Ultrasound gel is used to allow for the transmission of ultrasound beams into the body. The reflected sound provides information that our state of the art ultrasound machines use to create dynamic images of the blood flow and anatomy of the heart. 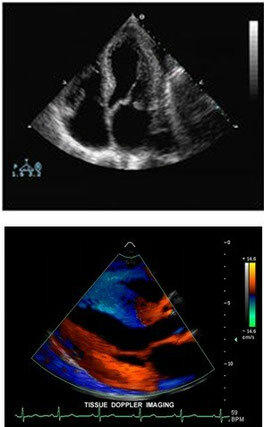 Doppler echocardiograms evaluate the blood flow in the heart and in the associated blood vessels. Using Doppler allows for the sonographer to evaluate how fast and in what direction the blood flow is flowing. Using Doppler allows for assessment of the heart function and function of the four valves of the heart. Stress echo combines the echocardiogram "echo" with the treadmill to walk on or medication that shows the effect of exercise on the heart muscle. Stress test are used to evaluate the narrowing of the blood vessels that supply blood to the heart muscle. The contrast echo is an echocardiogram that is performed with an IV that contains a solution which allows for visualization inside the heart and is used when certain anatomical diseases are suspected. The solution is harmless and you will need to have an IV started before the exam.